This museum for the art collection of bank magnate Dirk Scheringa has been designed as a house in three parts connected by a central axis. A bridge over a pool leads visitors into a large tall space set at right angles to the axis. This 'house for the public' contains the museum shop and café and other facilities. Behind this tall front is the 'house for the collection', an enclosed, intimate sequence of rooms for paintings, works on paper and sculptures. The 'house for guests' at the rear is for temporary and guest exhibitions. 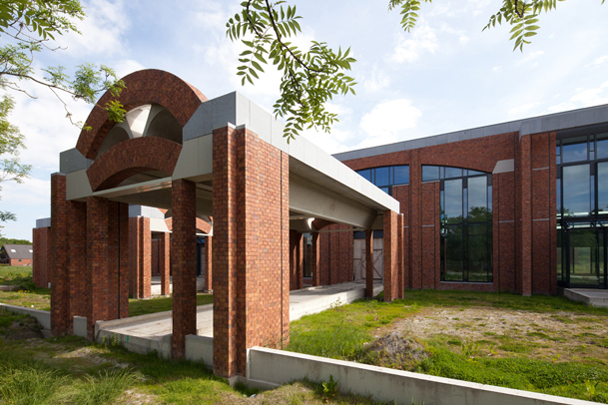 The architecture both inside and out is largely presided over by an order of precast concrete, fair-faced brick and white rendered walls that draws on the example of Louis Kahn. Much thought has been given to the admission of filtered daylight into the exhibition spaces. The museum was never completed after the demise of the DSB Bank.